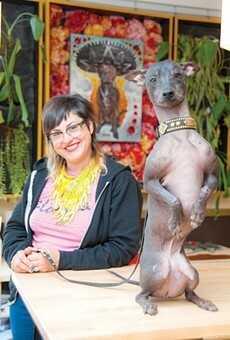 Founder and owner Ana Poe of Paco Collars with Xochitl. This is a specialty shop dedicated to the most important fashion accessory on the planet … for your dog. Yes, it’s a store just for dog collars. And what excellent collars they are. All of them at Paco’s are handmade with high-quality leather and custom bejeweling to ensure that your cat or dog is the most stylish pet on the block. They offer a wide variety of collar and leash designs, as well as the option to design your own unique collar. —P.R. Stroopwafels are ubiquitous in the Netherlands, but elsewhere the delightful snacks can be a challenge to track down. That’s too bad, considering their basically universal appeal: salty caramel sandwiched between two thin, crispy, wafer-like cookies. Before Oakland’s Lily Tsay and Todd Hartman took matters into their own hands, you could only find packaged stroopwafels in grocery aisles in the likes of World Market. In 2012, Tsay and Hartman launched the Stroopie Gourmet, pressing warm stroopwafels to order at farmers markets, festivals and other events all over the Bay Area. The classic ($4) is tough to beat, but the Stroopie Gourmet also offers fun takes on the original, such as filling the cookies with seasonal jam from the Blue Chair Fruit Company ($5); caramel studded with shreds of dark chocolate ($6); and a boldly savory concoction of bourbon, bacon, caramel, black pepper and shredded cheese ($7). —J.B. The Temescal District vintage shop, hair salon, and zine store Down at Lulu’s is a pretty-in-pink yet tough-as-nails storefront with something for everyone. Owned by Tina Lucchesi, and formerly co-owned by Seth Bogart of Hunx and His Punx, Lulu’s specializes in the glories and often unintentionally ethereal qualities of 1960s and 1970s era kitsch, with some 1980s and early 1990s vintage thrown in for good measure. Each individually chosen vintage piece is unique and unusual, and the collection’s strength lies in pieces adorned with spicy and juicy colors glowing out from psychedelic floral prints. If you are looking for new duds and a vintage inspired ’do, as well as a theme song on vinyl to make your entrances to, this is most certainly your one-stop shop. Their well curated zine selection is not one to miss, especially those made by locals. Finally, make sure to peep the ever-changing and ever-wonderful window displays, even if you’re just strolling past. —D.K. The Dry Garden is a public secret garden. Ivy vines and star jasmine grow abundantly on the ruins of a former 1950 era gas station. Since 1987, the Dry Garden has been delighting Hortisexuals with its variety of drought-resistant and low-water plants, especially those that are rare, unusual, and often bizarre. If you don’t find yourself falling madly in love with cacti covered in what seem to be fluffy white feathers or a pile of forlorn looking purple succulents that have smelly blossoms, there is a terrarium building station with dozens of tillandsias to choose from. The Dry Garden is inhabited by a very friendly older cat with fur of the acid wash variety. If you sit on the deck located next to the main offices, she will magically appear, ready to be pet, and, if you are truly lucky, cuddle up in your lap. Come for the ferns and stay for the furs. —D.K. 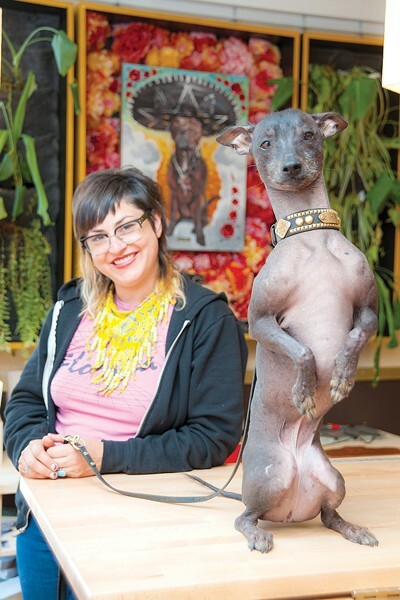 Since 1972, Tail of the Yak, owned by Alice Erb and Lauren McIntosh, has delighted visitors with an array of hand-curated textiles, toys, jewelry, and undefinable artifacts that feel like souvenirs taken from a story by Borges. A cage full of cooing doves greets visitors and provides equally good company for the wares, which vary from deadstock 1960s era Japanese tin insect pins, to the crepe “surprise balls” of local artist, Anandamayi Arnold. Paper ephemera features strongly in the shop, evident in the colorful crepe garlands and marbled paper globes from Mexico and an entire wall dedicated to a multitude of postcards and prints. The stock and the decorations of the Yak itself are ever-changing and evolving, as the store is more of an ongoing art collaboration between Erb and McIntosh and a variety of local artists who work to upend the binary between art and craft. —D.K. This downtown Berkeley fabric store has been around since 1981, though owners — and father and daughter duo — Bob and Suzan Steinberg are a part of a family’s century-long involvement with the California fabric industry. This ongoing legacy manifests itself in the store’s outstanding selection from all over the world, as well as a wide representation of different textile arts, varying from embroidery to needle felting. Stonemountain and Daughter also offers classes, led by local experts and artists, on a wide selection of subjects within the world of textiles that run the gamut from sewing crash courses to advanced pattern drafting. Even if you aren’t interested in sewing but want to support a lovely local business, stop in and check out their oilcloth selection to grab a new stinking cute 1960s chic Technicolor tablecloth. —D.K. Every Oakland fashionista already knows about Mercy Vintage. If you’re looking to get your hands on that 1970s polyester jumpsuit, or a hand beaded pants and crop top set, or a reasonably priced Chanel jacket, then this is your hot spot. Mercy Vintage is filled to the brim with amazing vintage finds and is heavily stocked with merchandise that appeals to a variety of tastes, be it heavy-metal-biker chic, rockabilly revival, burner glam, rap-star girlfriend or September Vogue center piece. This isn’t the place to find filler pieces that you will forget about next season; Mercy is 100 percent statement pieces that you will never forget and which you will wear year after year. The best part? They buy vintage clothing, too! So you can always trade in last year’s finds for store credit or cash which you can put to your next big purchase. —P.R. It may seem obvious what you should buy in a small, Elmwood dessert shop with “Chocolates” in the name. But there’s so much to choose from, between the shiny gems of truffles, light tres leches cake, frozen hot chocolate and creamy flan. Across the board, flavors burst with Latin American pride: cajeta, tamarind, guava, tequila, mezcal, Tapatio. When the options start to overwhelm, reach for the easy, always-reliable chocolate bar — specifically, the 61 percent mole chocolate bar ($3-$7). From that dark brown surface, eleven spices and chiles glitter and create a subtle, nuanced heat with a long lasting finish. It doesn’t taste exactly like its namesake Mexican sauce, but would you really want that? Instead, Casa de Chocolates pares mole poblano down to its warm, comforting essence: sweet, savory and spicy flavors. —J.B. This is for all you day-one Tumblr brujas who have decided to hop on the bandwagon when it comes to hexing Brock Turner or cursing Donald Trump and the National Rifle Association (as popular internet campaigns might inspire you to do). If the place where you buy your magic supplies doesn’t slightly creep you out, then you’re doing it wrong. Which is why we suggest hoofing it to the East to experience the real deal, along with an ample selection of strange candles, oils, and incenses. If you want to see how a real altar is set up, just poke around and check it out. Tarot-card readings and egg cleansings are offered here, as well, so if you need a bit of celestial guidance while picking up those separar and doblegate a mi candles while hexing your ex-boyfriend, this is the place to do it. Trust me: From personal experience, I can tell you that these candles work miracles. —P.R. Load up on Black Panther memerobilia and more at the Ashby Market. Beyonce may have made it trendy to throw a fist up every now and then, but if your interest in our local cultural icons the Black Panthers extends beyond vague pop culture references, then get yourself to the Ashby Flea Market so you can buy yourself an Angela Davis pin and peruse their literature promoting Black empowerment. You can get your hands on various Black Panther paraphernalia over there, as well as talk about the current state of the Black Panther Party. A must do if you’re looking to radicalize your weekend morning thrifting adventures. —P.R. A box of marzipan dressed up like little fruits or pigs rarely elicits much excitement. Marzipan feels distinctly Old World — the exact opposite of the sort of daring, innovative, fusion-y foodstuff we’ve come to expect from trendy new products. Perhaps it’s not surprising, then, that Oakland’s Nuttyness comes from a Norwegian, Kristian Salvesen, who grew up with marzipan-filled holiday traditions every winter. In the United States, he searched to no avail for a version of the chocolate-covered marzipan bars he loved as a kid. In 2013, he launched Nuttyness, blending European technique with California’s almond bounty. Each bar ($5.99) presents smooth, soft, chewy marzipan enrobed in silky dark chocolate. For a unique, totally American variation, try Nuttyness bars mixed with pistachios or hazelnuts. Either way, they are way more dynamic than the standard marzipan banana. Find them at area specialty grocers, such as the Pasta Shop and Piedmont Grocery. —J.B. Hippie Christmas comes but twice a year, but if you’re looking to embrace the UC Berkeley college culture of “throw it away at the end of the semester if you can’t drive it back home” year round, then Buffalo Exchange is the solution. Cash-strapped students have been known to pawn off their best pieces just to make a few extra bucks. This works out well for the thrifty yet fashionable shopper, who might stumble upon a slightly worn Prada blouse or a rack full of full length, 1970s psychedelic quilted Gunne Sax skirts for $12.50 a piece. Whether you’re looking for some cheap basics or something funky and fun, Buffalo Exchange is a mecca for Bay Area thrifters who don’t mind hunting for a piece of discounted sartorial gold. —P.R. Ikea might be everyone’s go to store when looking to buy cheap crap to fill an apartment, but when it comes time to decorate your apartment with something other than the mass-produced pseudo-art of yet another corporate chain, make Neighbor your first stop. The store is filled with posh pieces that set the bar for what stylish young Oaklanders should keep in their home: plush sheepskin rugs, vintage textiles, tie-dyed pillows, an assortment of candles, lighting fixtures, mounted rams heads and more. It’s everything you want to make your house a home and not just another knock-off headquarters. Because if you can actually afford to live in Oakland, you might as well live in style? —P.R. Barney’s is just a BART ride away, but the clothing and accessories they sell are worlds away from what most of us can afford. Which is why it’s nice to window shop. But if you’re dying to get your hands on something with a label that will make you feel like a princess, then pop over to Maribel, where last season’s Barney’s cast-offs make regular appearances on their racks. Their dedication to carrying high-end designer clothing shows in their collection of Kate Spade and Gucci purses, Manolo Blahnik shoes, Chanel jackets, and Missoni dresses. Mid-level designers such as Rebecca Minkoff, Free People, and Marc Jacobs likewise adorn the racks, offering pieces in every price point and style. So if you’re looking to strut your stuff without breaking your wallet, you’ve found your place. —P.R. The dream of a perfect apartment — with ample lighting, renovated interiors, and an edible garden — is fast fading in the expensive East Bay housing market. All the more reason to reinvest your dreams into improving your current living quarters with help from the Berkeley Tool Lending Library. Started in a trailer with two-hundred tools in 1979, the current library was renovated in 2012 and houses more than 3,500 tools for Berkeley residents and property owners. For three to seven days at a time, tools varying from the simple hammer and screwdriver to saw tables, ladders, and cement mixers can be yours to borrow. The library’s website has a comprehensive list of all available tools ,complete with item-specific late fines. Although they are open late until 8 p.m. on Tuesdays and Wednesdays, the lending library is closed on Sundays and Mondays. —R.Ge. 10979 San Pablo Ave., El Cerrito, 510-592-3002, Playland-not-at-the-beach.org. If you’re looking for a sense of childhood nostalgia, Playland Not at the Beach is a chance to relive the glory days of beach boardwalks and pinball arcades. There are dozens of old-school arcade games scattered throughout the building — favorites like Pac-Man and Donkey Kong — along with a room of over thirty pinball machines, all on free play. There’s also skee-ball, bowler roller and an old school Fascination table. Cost is $15 for adults and $10 for kids to experience the Playland magic. You’ll have a blast with the kids, but adults can take in the fun during Playland’s grown-up game nights on the second Tuesday and last Thursday of each month. Feel free to bring snacks and or your favorite wine or beer. Whenever you decide to visit Playland, there’s just one cardinal rule: Any adult not acting like a child, must be accompanied by one. —N.D. The Alameda Antique’s Fair happens once a month, but for those looking for that “lost in a Narnia of antiques and thrift finds” feeling, then Pauline’s is the place. With two stories of antiques — jewelry, dishes, clothing, books, random knickknacks, paintings, pieces you never thought you’d wind up buying — you’re sure to find something fascinating to take home. Give yourself a bit of time to squeeze your way through the store; everything is heaped on top of each other, nothing is priced, and wacky finds are sandwiched in with pure gold. It’s a recreational treasure hunt for anybody who needs to scratch their antique safari itch on any given day of the week. —P.R. Sock savants rejoice! Located blocks from UC Berkeley, Sockshop Telegraph is the East Bay epicenter of fun footwear. Boasting nearly three decades in the hosiery business, owners Ellen and Eric Gil have been delighting the Berkeley student population with their colorful wares since 2002. The shop is not lacking in traditional sockwear, tights, and leggings — but it’s best known for its impressive array of how-did-they-think-of-that novelty socks. At the Sockshop, you can fulfill all your spiritual sock needs (see: Hamsa, Christ, and Buddha designs) while picking between a Van Gogh and Da Vinci pair. And what better way to claim your allegiance, whether it be to Cal football or your beloved corgi, than by toting a relevant design on your ankle? An affordable and reliable stop for gifts, Sockshop Telegraph reminds us that the utilitarian can and should be fun. —A.S. Watching the model-railroad trains circling the tracks at the Golden State Model Railroad Museum is enough to bring out the kid in all of us. The 10,000-square-foot display features three model layouts and historic views of Bay Area railroad scenes, all built and operated by members of the East Bay Model Engineers Society. The three model railroads cover 10,000 square feet and vary from stream locomotives, diesel freight, and passenger trains. While kids watch the trains with wonder and amusement, adults enjoy the recreated California scenes from the Altamont Pass and Truckee, to Sacramento and Oakland. Each layout is dotingly set in the Fifties and Sixties with little scenes of life from the lights flicking in the miniature movie theater to the tiny grazing cattle. The train museum is open on Wednesday, Saturday and Friday for viewing. But if you want to see the trains in motion, hop onboard on Sunday afternoons between April and December. Cost is $5 for adults and children over 12, $3 for seniors and children ages 4 to 11. —N.D. 1AM manager Matthew Gregorio will help you master your art craft. If you’re the kind of person who has a yen to scrawl such quintessentially Oakland slogans as “ACAB” or “Recall Shaaf” on the walls of abandoned buildings, but you’re not sure how to go about getting into the game, then 1AM is the spot. 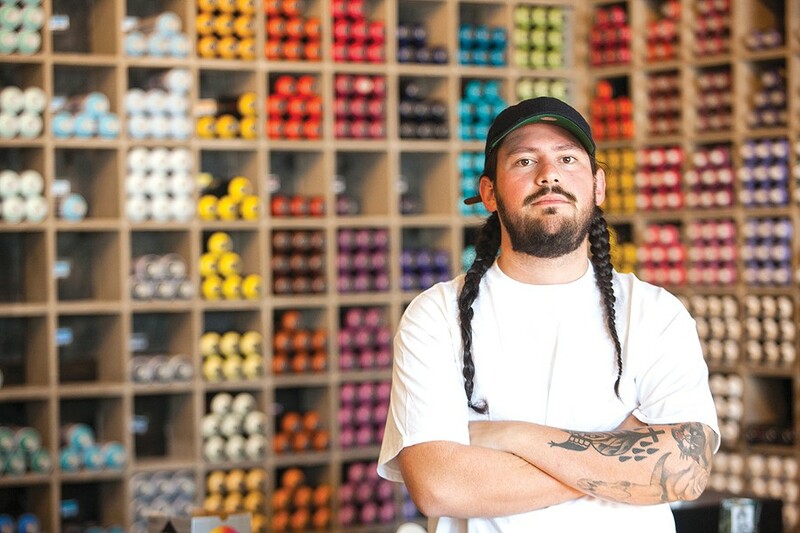 Stocked with spray cans in every color of the rainbow plus streakers and mops, every young graffiti artist’s heart is sure to go pitter-patter at the sight of so many high-quality art supplies. There’s also materials for fine-art pursuits amid the large stock of goodies. With regular art openings featuring some of the best in the craft, 1AM is the best spot to pick up supplies and talk shop with other people who know what’s up. —P.R. Residents of West and North Berkeley can attest that CCCM was an instand neighborhood upgrade. 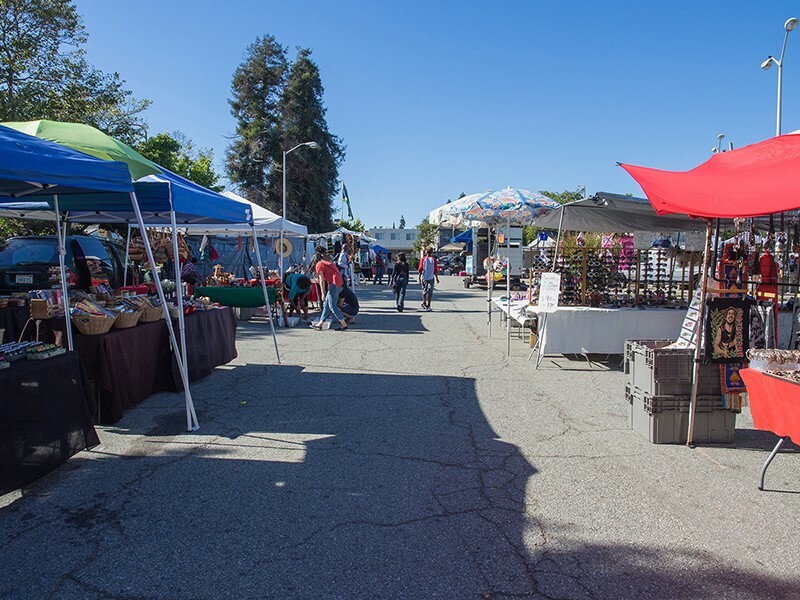 The market provides a variety of local and imported goods to keep your pantry and fridge stocked. But the best item are Mom’s Rolls at the San Pablo Avenue location. Made by the matriarch of the business, who customers refer to as “Mom,” the rice-noodle rolls come in packs of three, with vegetarian, shrimp and chicken options, and a side of peanut and sweet and spicy dipping sauces. Country Cheese is as convenient as a corner market gets. —R.Ge. This isn’t Toys ’R’ Us. Devoid of garish neon lighting and aisle upon aisle of plastic children’s junk, Mr. Mopp’s embodies very Berkeley values translated into a toy haven. Mopp’s is also an institution, which has been selling educational toys to kids since the 1960s. And while there might not be anything overtly radical about the shop itself, its dedication is to toys that don’t perpetuate the Disney Princess paradigm. —P.R. 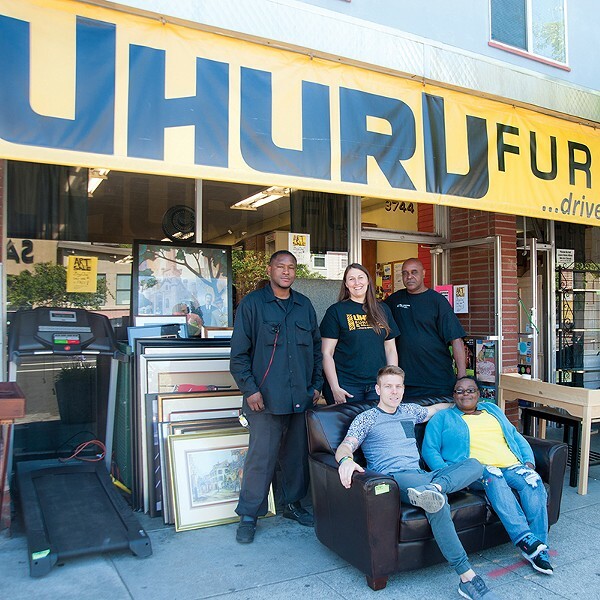 The team at Uhuru will help you up your furniture game. For 28 years and counting, Uhuru Furniture & Collectibles has offered fast and free pickup of donated furniture at affordable prices. It is a place devoid of pretense and full of interesting and functional furniture pieces. And the sense of community at the store likely comes from Uhuru’s bigger mission as an economic project of the African People’s Education & Defense Fund, an organization that strives to develop and institutionalize programs to defend the human and civil rights of the African community. The profit from the furniture sales allow APEDF to run events such as this past Spring’s Health is Freedom fair, which featured local organizations that provided free information and services to attendees. For those interested in keeping up with Uhuru’s furniture offerings, their blog is updated weekly and features new items photographed on the sidewalks of Grand Avenue. —R.Ge.